Happy International Panic Day! The sheer joy felt during a WSP show can only be made possible by these incredible musicians and the community around them. Thanks to their long and storied path, they’ve had the opportunity to develop, learn, and grow themselves, while becoming incredibly confident and skilled in their craft. In celebration of their legacy, here are some great stories of favorite songs, iconic history, and lasting impacts as a band. Widespread Panic was formed in the small college town Athens, GA in the mid-1980s. John Bell (guitar, vocals), Michael Houser (guitar) and Dave Schools (bass) all got together with the dream of playing in a rock band, where they experimented with many musicians to find the right fit. They eventually would meet Todd Nance (drums), where they officially became a “band” in 1987. Down the road, they would link up with John “Jojo” Hermann (keyboards) in 1992, and Domingo “Sunny” Ortiz (percussion). Today, Jimmy Herring fills the shoes of the late Mikey Houser on lead guitar, and Duane Trucks, Jimmy’s son in law, has taken reins on the drum kit. Perhaps the member with the most lore and symbolism of Widespread Panic is Mikey Houser. Houser was a founding member, and wrote a great deal of the band’s material, including “The Waker,” “Blue Indian,” “Porch Song,” “Airplane”, and “Ain’t Life Grand”. Houser even taught Nance to play guitar and was a longtime friend of the drummer prior to the formation of the band. His signature guitar playing defined Widespread Panic’s sound in the early, crucial years of their career. Houser played passionately night in and night out, and even released his own solo material. Houser sadly passed away in 2002 to pancreatic cancer at age 40. To this day, Panic fans remember Houser as the core member of the group. One of Houser’s signature songs, “Surprise Valley,” remains a staple in the band’s live shows and recordings. The tune is based on their love of Colorado, which has become a “second home” to the band according to Dave Schools. Enjoy a tasty version from Red Rocks Amphitheatre below, a venue that also holds special significance for the band. On September 14, 1991, Widespread Panic took over the Red Rocks stage for the very first time. They were under Blues Traveler’s wings, where they gained valuable experience in the region. A few years later, Jimmy Herring would find himself with Widespread Panic during an installment of the H.O.R.D.E. tour that made its stop at Red Rocks, although at that time he was in Aquarium Rescue Unit. Since then, Widespread Panic has gone on to sell out Red Rocks 50 consecutive times as of 2016. Their shows at Red Rocks are considered one of the hottest tickets for fans each year. Like many young rock bands in the 20th century, Widespread Panic enjoyed a few memories with legendary concert promoter Bill Graham. The band was playing a three day festival in Telluride, CO early in their career, warming things up for Jackson Browne and The Allman Brothers Band. Graham told the band, without them knowing prior, that he was a big fan. After their 45-minute set was over, Graham said: “I think those people deserve an encore, don’t you?” This fueled the band with confidence. Watch the full story below! Ever wonder what’s going through a band’s head when they’re in the heat of a crazy jam? Widespread Panic has a good way of explaining it. They consider their jams to be “conversations” between the band members with instruments, and that this aspect of their live show is what keeps them entertained and going strong. Jimmy Herring, who joined in 2006, describes what it’s like to learn all of the songs in a new band and jam them out on stage, something he clearly loves to do. John Bell has also been known to “freestyle” on stage, which we can learn about more below. Check out this great footage on how the band works their magic on stage and what it means to them! 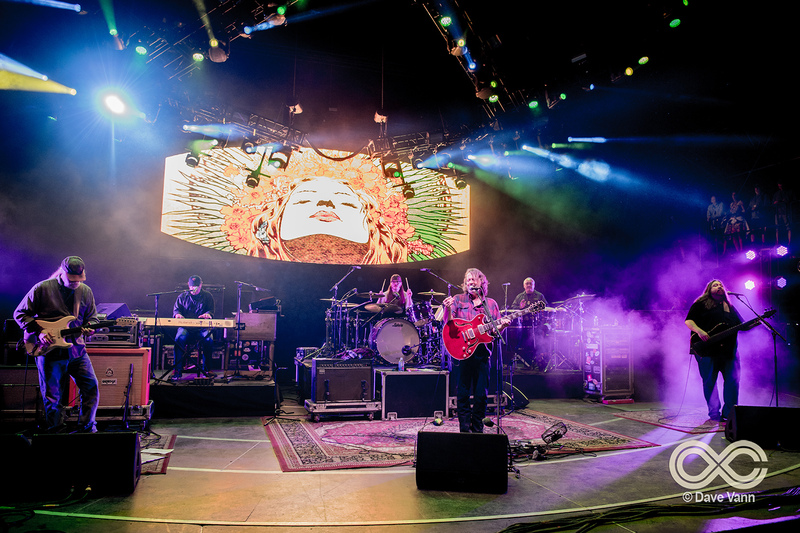 Widespread Panic has had a very impressive career and recently hit their 30th anniversary as a band. While the band has slowed down on their touring life, they are still cracking out three night runs all over the country, as well as performing in many festivals, including LOCKN’! There’s nothing like Panic at LOCKN’ and we can’t wait for them to return to the farm. Here’s to you Widespread Panic! The world is a better place thanks to your music. Happy Panic Day!